Welcome to our first in a series of conversations with New Zealand artists, designers, crafters, and people who make things! And breaking the ice is our very own Katherine Quinn of Sleep and her sisters. 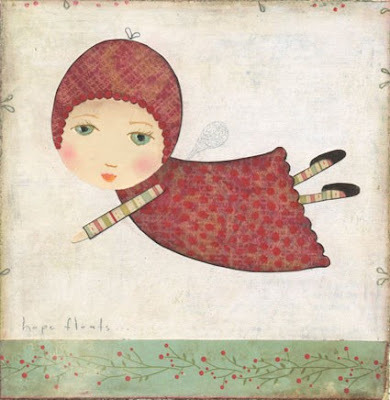 She makes wonderful collages and paintings and sells high quality art prints of them on Etsy. I am a part time artist under the name Sleep and her sisters… I have two children, a 17 year old and a nearly 5 year old. Collecting apple lollies makes me happy. I paint and collage, I like to sew and draw. And I am also obsessed with paper, and stationery. My light, clock, a Jodi Picoult book, half an Incrediable Hulk (where the other half is I am not sure)? A pencil, a pair of pliers (needed for a quick repair job on a necklace before work last week). Squam… it will be an experience that will open you up to your best self and reconnect you with what makes you most happy. An Artful Journey… awaken your senses, nourish your soul, replenish your spirit, learn, share, connect. Be Present Retreat… An invitation to pause in your life and gather in an intimate, creative community to explore, create, discover, and soak up the world around you. Each retreat includes creative workshops paired with exercises to remind you to open your eyes and heart and be present on your path. Each retreat also encourages a balance of time spent in community with time to reconnect with you. I think of life like it’s a 50 cent mix bag of lollies, make sure your week has a bit of everything in it. I would love it to be a studio one day but for now it is my Kitchen table. Write and publish a series of children's books with a wonderful and supportive publisher. To have a licencing deal and produce a beautiful range of stationery and products. Work full time as an artist earning a good living doing what makes me happy. Earn enough to be able to travel and visit my new friends around the world. Be involved in the creative community in Hawke's Bay and New Zealand. Develop a stunning website with a clever designer. Take part in art retreat in the States. A dream I would like to be a part of would be to have a local art supplies shop that would have a cute little gallery and café attached. A great interview Katherine. I think you make a wonderful children's book author and illustrator!